Our research finds that topical flea treatments like Advantage and Frontline can provide long lasting relief from fleas and ticks. We also name some top oral medications, and one of the few flea collars that's safe and effective. We discuss other alternatives, too, and why most generally are ineffective at best, and possibly hazardous at worst. Frontline Plus for Dogs is topical treatment that kills not only fleas, flea eggs and larvae, but also ticks and chewing lice. Most reviews say that the product is highly effective, but some say it didn't help at all. Generic versions are also available; experts say that some work just as well as Frontline Plus, but others do not -- and be wary of counterfeit products, which might be the source of some complaints over effectiveness. 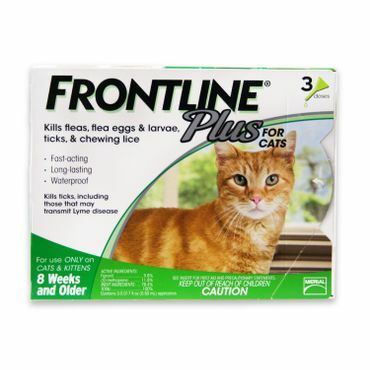 Frontline Plus for Cats is a cat-safe flea treatment that kills ticks as well as fleas, flea eggs and larvae. Many cat owners find this product highly effective, though we've also seen a significant number of complaints that it doesn't work at all. The flea hyperactivity it induces is sometimes mistaken for an increase in fleas. Generic versions are available; some are good alternatives, though the cheapest are judged to be less effective. While experts and users say that most flea collars are ineffective or even toxic, they make a very notable exception when it comes to the Seresto Flea and Tick Collar. It uses the same active ingredient as Advantage II to get rid of fleas, coupled with an effective tick repellent and killer, in a slow release formulation that provides up to eight months of protection. Versions are available for small and large dogs, and for cats. Fleas are more than an annoyance -- they can affect the health of their host dog or cat. A flea's saliva could trigger allergies, and the itching and scratching that ensues can lead to a more serious skin infection. Infected fleas can also transmit tapeworms and bacteria -- including bacteria that are harmful to humans. A large enough number of fleas can even cause life-threatening blood loss. Unfortunately, fleas are not a problem that will go away on its own. In fact, ignoring a few fleas can quickly lead to an infestation. Female fleas can lay up to 50 eggs a day, many of which fall off and land in carpets, bedding and furniture. Once the larvae hatch, they remain inactive in cocoons for weeks or even months. Unsuspecting pet owners might think the problem is resolved after killing the adult fleas, but the life cycle will repeat weeks later unless eggs and larvae are prevented from maturing into more adult fleas. Experts say the most effective way to keep fleas off a dog or cat is with a topical or oral medication. Also known as spot-on products, topical treatments are squeezed out of a tube and applied to the pet's neck or back. One advantage of these products is that they generally contain insect growth regulators (IGRs), which prevent eggs from hatching and larvae from maturing into adult fleas. This means that a single application can completely eliminate fleas for up to a month. However, these products have drawbacks as well. Although they're generally safe for pets if applied correctly, they can irritate the skin or eyes of humans; should you come in contact with the product, it must be rinsed off promptly. Once applied, the product may take several hours to dry. During this time, it may rinse off in water, and the residue may transfer to other pets, furniture or humans. Moreover, some pet owners find the smell or feel of the spot-on treatments unpleasant. Until recently, experts have said that flea collars are generally ineffective; some are toxic to pets and people as well. There is one exception, however, Seresto, which uses the same active ingredient as a well-rated topical treatment, Advantage, but in a slow-release formulation. Seresto also has a tick killing ingredient. Seresto is pricey, so other options are more cost effective if you pet is indoors most or all of the time, but for pets that spend lots of time out of doors, it can make sense. No other flea collar receives much, if any, positive feedback from pet experts. Flea control medications pose no risk to humans, and they don't leave any messy residue. Oral flea treatments tend to kill adult fleas very quickly, but most of them don't contain an IGR to deal with the eggs and larvae. This means that pet owners must either combine the tablet with a second treatment that contains an IGR, such as a spot-on product, or keep repeating the dose until no new fleas are hatching. Another problem is getting a pet to take the pill. While some users say their pets will gobble them happily if they're tucked inside a treat, others -- especially cat owners -- find it very difficult to get them down their pets' throats. Also, some oral medications are available only with a prescription from a vet. Flea shampoos can provide immediate relief by killing adult fleas on the pet, but they don't leave enough residue behind to kill new fleas as they hatch. As for flea dips, bombs, powders and most sprays (see below for more information), many of them contain chemicals called pyrethroids, such as permethrin. Experts warn that these chemicals are highly toxic, especially to cats. Some vets say that products containing permethrin can be safe if you only have dogs in your household, but all warn to not use such products on cats or even on dogs if one is likely to come in contact with a cat. Permethrin comes in for the sternest cautions, but some experts also warn against the use of other pyrethroids as well. "On Fleas and Ticks - The 2016 Update"
Comparative, unbiased testing is hard to find when it comes to flea control products. Reviews.com publishes one of the few we spotted, but it relies on research to determine effectiveness, turning to testing only to ascertain things like ease of use. One scientific journal, Parasites & Vectors, provides testing based information and is also helpful, but is written for a professional audience, rather than pet owners, and some of the research is paid for by flea control makers, so though peer-reviewed, bias can't be ruled out. The Natural Resources Defense Council provides feedback on the relative safety of many products, but doesn't weigh in at all on effectiveness. In light of that, we looked primarily at feedback from veterinarians and other recognized pet experts who have extensive experience with the options, their relative effectiveness, and their safety. The rest of the feedback is supplied by pet owners. We scoured thousands of user reviews at sites like Amazon, Petco, and 1800PetMeds to find flea control treatments that pet owners say are effective and safe. We looked at both positive and negative feedback -- assessing the latter to weed out instances where supplier issues or incorrect usage might be factors -- to find those options that work successfully to rid pets of fleas and, in some instances, other parasites. The result of that research is our recommendation for the best topical and oral flea control products. The top two topical flea treatments for both dogs and cats are Advantage II and Frontline Plus. They use different active ingredients, imidacloprid and fipronil, respectively, to eradicate infestations. The two insecticides work differently, but experts say that when used correctly, they are both safe and effective. Both products receive mostly positive reviews from veterinarians and pet owners, but we found somewhat stronger recommendations for Advantage II. Cat owners, in particular, tend to give Advantage II for Cats (Est. $45 for a four-month supply) high marks for its effectiveness, safety and ease of use. While it does not work for every cat, it's more consistently effective than any other topical treatment. Most owners also find it easy to apply and are not bothered by the odor. 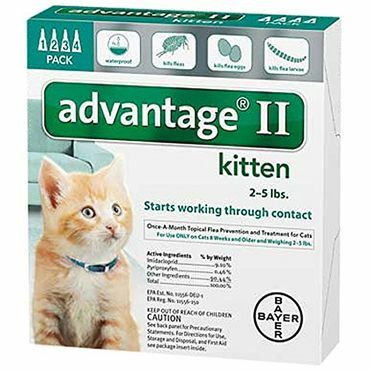 Advantage II is a reformulated version of an older product called Advantage, first released in 1996, which killed only adult fleas. The current version includes an insect growth regulator (IGR) to kill flea eggs and larvae as well. Both the original Advantage and Advantage II get positive reviews from veterinarians, including those who specialize in cat care. Vets at the All Feline Hospital in Lincoln, Neb., describe Advantage II as "very safe and effective on cats." However, reviews from cat owners indicate that in very rare cases, cats may have dangerous reactions to this treatment, so it's probably wise to consult a vet before use. Advantage II for Dogs (Est. 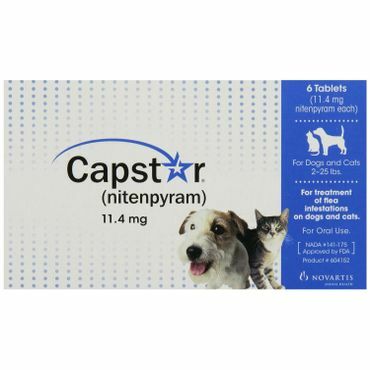 $45 for a four-month supply) is sold in several different dosages, for small, medium, large and extra-large dogs; as you might expect, versions for larger dogs cost a little more than those for smaller ones. Dog owners are not quite as enthusiastic about Advantage II as cat owners. Although most owners find it effective, dog owners were more likely than cat owners to complain that Advantage II either didn't work or stopped working before the one-month treatment period was up. Veterinarian dermatologist Jon Plant, writing at the Itchy Dog Blog, notes a study, albeit in cats, that shows some drop in effectiveness toward the end of a month. He adds that "the Advantage line of products are generally very effective for flea control in most situations, when used as directed (monthly)." Bayer (the maker of Advantage II) also offers Advantage Multi (Est. $80 and up for a 6 month supply). Advantage Multi, offered by prescription only and in formulations for dogs and cats, adds additional protections against hookworms, round worms and other parasites (depending on the species). However, it is not an all-life cycle flea killer and is only effective on adult fleas, not flea eggs and larvae. The cat version is the only product that's also FDA approved for use on ferrets (minimum weight of 2 pounds). One disadvantage to products in the Advantage line is that they don't protect against ticks. If that's a concern, a different product could be a better choice. Frontline Plus, like Advantage II, is a reformulated version of an older product. The original Frontline killed adult fleas, as well as lice and ticks. 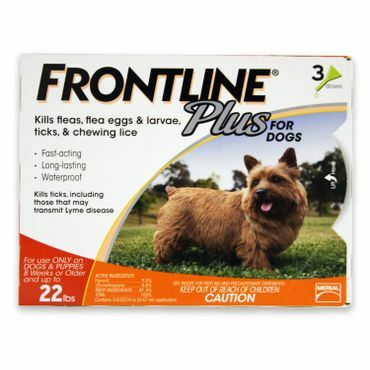 The new version, Frontline Plus, also contains an IGR to kill fleas at every stage of their life cycle. It continues to protect against ticks and chewing lice as well, something that Advantage II can't do. Frontline Plus for Cats (Est. $35 for a three month supply) comes in a single formulation. Frontline Plus for Dogs (Est. 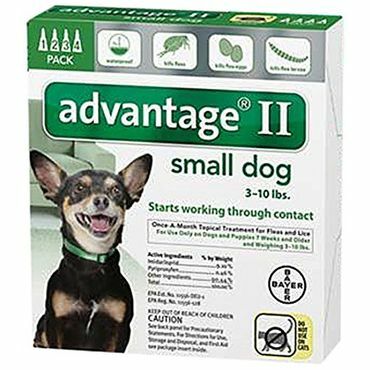 $35 and up for a three month supply), like Advantage II for Dogs, comes in four dosage versions for dogs of different sizes. Frontline Plus gets high marks for safety from both vets and pet owners. Frontline works by over-stimulating a flea's nervous system, making them hyperactive before they die. That can make it look like your pet's flea infestation is actually getting worse as fleas that were previously unseen rise to the top of the pet's coat, and that results in some negative feedback in user reviews, but vets have few reservations. Dr. Plant notes that Frontline Plus is "100% effective at 12 and 24 hours from 1 day to 28 days post treatment." Frontline Plus is also the top rated topical treatment for both dogs and cats at Reviews.com, with editors there saying that the found that its applicator was the easiest to use. There have been some reports, such as this article in The New York Times, indicating that, while fleas in a few parts of the country have become more resistant to fipronil (the active ingredient in Frontline), it and other treatments are still largely still effective in most regions. That's echoed in comments by Dr. Thomas B. McMillen at the Mercy Animal Hospital in Cranston, R.I., who says "There have apparently been some resistance problems in Florida, but there is no evidence of that around here." In a study published in Parasites & Vectors, a scientific journal, researchers Tad Coles and Michael Dryden find that reports of resistance to flea treatments is more likely to be caused by improper or insufficient application rather than resistance to the product by the fleas or other pests themselves. Consumer Reports notes that, because the patent for fipronil has expired, generic versions of Frontline Plus are now available. Examples include Pet Armor Plus for Dogs (Est. $10 and up for a three month supply) and Sentry Fiproguard Plus for Dogs (Est. $16 and up for a three month supply). Formulations for cats are also available, as are generic versions of the original Frontline, designed to kill adult fleas but not eggs or larvae. Experts do sound some cautions, however. While the active ingredients are the same, inactive ingredients can differ. Consumer Reports says that the least expensive generic substitutes can have lower dosages, requiring you to treat more often. The Whole Dog Journal specifically recommends against using low-budget spot on treatments as they can be more toxic and less effective than those "made by the most reputable and responsible manufacturers." Still, some vets and other experts consider generic versions of Frontline to be a reasonable alternative where budgets are a concern. If you are considering a generic version of Frontline or Frontline Plus, the best guidance would be to ask your vet. Finally, choose your vendor wisely as counterfeit versions of Frontline Plus have also been reported. If cost is a concern, Frontline Spray (Est. $40 for an 8.5 ounce bottle), which has the same active ingredient (fipronil) as the spot-on product, may be another alternative. The vets at All Feline Hospital say that it's "just as effective, and one bottle can cover many multiples of cats, dropping the cost per cat or per application significantly." The downside, they say, is that it has to be applied to the entire animal, so it's harder to use than the spot-on version. For dog owners who want to control both fleas and ticks, another option is K9 Advantix II (Est. $45 and up for a 4-month supply). Made by the same company that makes Advantage II, K9 Advantix II contains the same ingredients, plus an additional ingredient called permethrin that kills ticks and mosquitoes. Permethrin is highly toxic to cats, so K9 Advantix II is for use on dogs only. While permethrin is not generally considered harmful to dogs, reviews from dog owners suggest that K9 Advantix II is more likely to cause side effects than either Advantage II or Frontline Plus. Skin irritation is the most common problem, but a few owners describe more serious reactions. Still, K9 Advantix II appears to be an effective product for treating both fleas and ticks in dogs. In general, flea collars get a thumbs down from experts as being both ineffective and often toxic. One that breaks from the pack, however, is the Seresto Flea and Tick Collar (Est. $55). This uses imidacloprid , which is the same active ingredient as Advantage, and is made by the same company, but in a gradual release format that keeps pets pest free for eight months. There's no IGR, but one's not needed as the active ingredient is constantly killing fleas as they emerge. Seresto collars also have a tick-killing component, flumethrin, so they are a great choice for animals that spend a lot of time outdoors. Vet feedback thus far has been largely positive, and the Seresto flea collar receives lots of user feedback at sites like Amazon, most of which has been very good. In a blog post, Nancy Kearns of The Whole Dog Journal reports using Seresto to keep her dogs flea free after an outbreak had been eradicated. "So far, so good; I haven't spotted any fleas, and you can believe I've been looking," she writes. Dr. Plant notes that it kills 100 percent of existing fleas on dogs within 24 hours, and re-infesting fleas in two hours. It's also 98 percent effective on cats within 6 hours. One caution that he shares is that, while the collar is rated to be effective for eight months, frequent swimming or bathing can reduce that duration. Adverse reactions seem to be relatively rare. 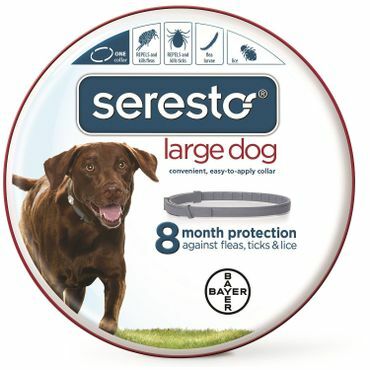 However, since this flea collar uses the same active ingredient as Advantage, if your pet has had a reaction to Advantage, or has otherwise not done well with the product, Seresto also won't be a good choice. Some complaints are seen about the cost, a concern that Kearns echoes as well, especially for those with multiple pets, but keep in mind that a single collar is the equivalent of eight monthly does of Advantage. Versions are available for both dogs and cats. Kills adult fleas, eggs and larvae.